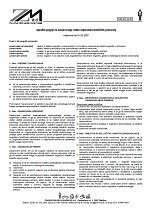 general terms - Insurance company - Zavarovalnica Sava d.d. a) Accident, death or unexpected worsening of medical condition, which prohibits insured person a travel. b) Accident, death or unexpected worsening of medical condition of closest relatives (consort, parents, children, grandchildren, brothers, sisters) which prohibits insured person a travel. c) Military drafts or court summons where presence of insured person is obligatory. d) Accidents due to natural forces, which prohibits insured person a travel. Insurance company also covers expenses to insured person, which originated from travelling alone, due to cancellation of travel by co - insured persons, quoted on the insurance policy, who cancelled the travel due to the causes mentioned above. Only one insured person is entitle to this kind of cancellation and it has to be obvious from cancellation documentation (collective registration and collective insurance policy, damage report of co - travellers). Insured person has to inform the company as soon as it becomes obvious that he or she will not be able to travel. It has to be done in writing. - therapeutic steps taken to improve the condition.